« If you love baked beans you’ll love this! The leftover salsa verde will keep in the fridge and is lovely with meat, fish or bruschetta. To make the salsa verde, drop the herbs into boiling water for a few seconds, then drain and refresh under cold water. Squeeze out the water, then put on a chopping board with the garlic, capers, olives and anchovies and finely chop everything together. Scrape into a bowl and add the lemon zest, mustard, lemon juice, olive oil and some black pepper. Heat a cast-iron griddle pan over a high heat. Brush the tuna with olive oil and season with sea salt. Put them on the griddle, turn the heat down to medium high and cook for 30 seconds to 1 minute on each side so you get nice char marks but the fish is rare on the inside. 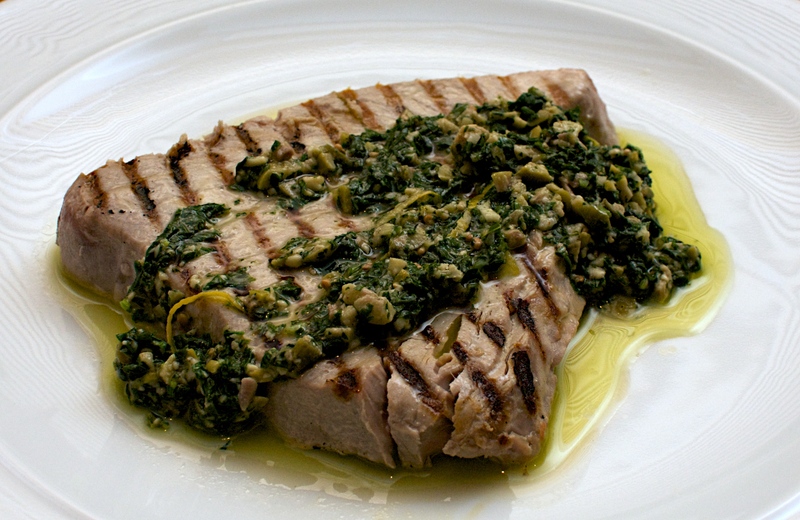 Serve the tuna steaks with the salsa verde spooned over the top. (Original recipe by José Pizarro for Sainsbury’s Magazine, October 2011).